“Give…me..a keg of beer!”. No, wait, that’s from something else. Anyways, the sounds of postrock have always been linked to either really depressing atmospheres filled with drones or to very happy, fast music. 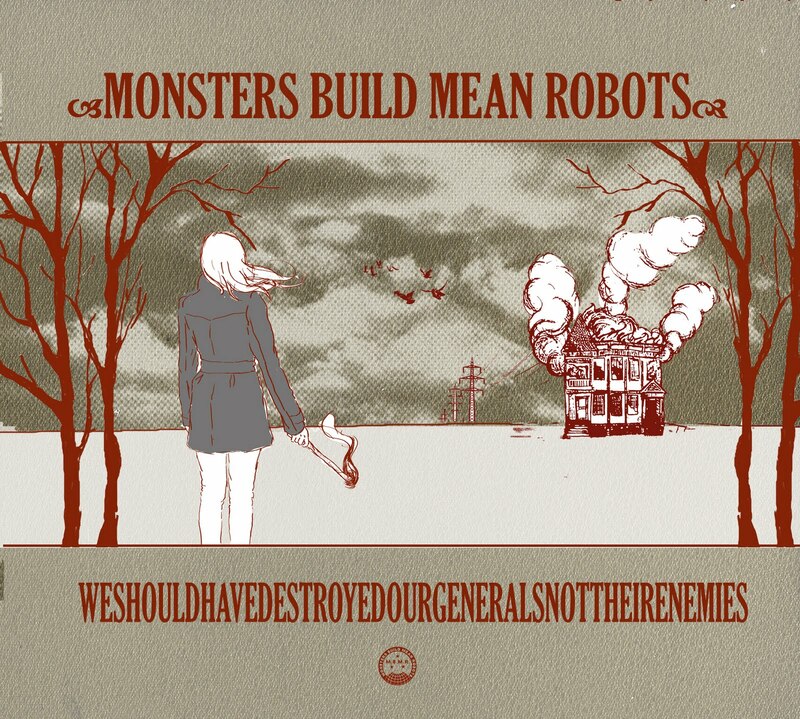 I seriously don’t know if Monsters make mean robots is post rock, but they do have an optimistic streak on their complex music. Their recent album, We should have destroyed our generals not their enemies, is a gordian knot of majestic chords, strange sampled noises (swear to God there’s a sample of Fight Club in there) and layers of voices that become another instrument thrown into the fray. ‘A reverie for the riots’ is the first transmission from a long lost radio station. For almost ten minutes (and this is the first song, bold move indeed), Monsters build Mean robots create a very powerful type of music. It gets you. It makes you stop looking at the past, whether for good or bad and it makes you appreciate what you have at the moment. The lyrics get a little lost, but the feelings are there, without any special bells and whistles. ‘Lament 77 (we will follow)’ follow suit, adding a spot of melodica to the already overcrowded (but not cacophonous) sound. Some very fast fingerpicking is juxtaposed to the contusion-inducing chords and drums that make it a spiritual song. A song with a magnificent title follow. ‘Psalm 57 (or all that gold did not help your soul! )’ seems to be following the ideas laid out by the two previous songs. This doesn’t mean the band is repeating itself, not at all. It just feels these three songs are very cohesive and probably were one big song split in 3 (see Mars Volta‘s second album). Remember that thing I said about Post Rock sometimes being a little crestfallen/under the weather/chipil? Well, ‘Song for the generals’ is that moment in the album. Maybe it’s finding an old photograph of people who no longer talk to you or are no longer around. Maybe it’s that yellow leave that fell and signals the end of Summer. Maybe it’s just one misplaced sigh. Whatever it is, it’s a sad moment that you relish as you know there will be a happy one to counter it. Love the ebow in this one, specially since it’s what links the song with its happier, hope explosion of an ending. The album finishes with another slow groove that inevitably explodes. ‘The witches and the liars’ meanders, your feelings got like flotsam and jetsam but then you start to feel a rush of good vibes, it all feels hopeful…and then you are swallowed by a whirlpool and end up surrounded by molemen. And then you escape by a waterfall and either find freedom or a T. Rex finding you on the other side. Whatever you want to choose, the truth is that the song just ends abruptly, Sopranos-style. It’s a nice touch. 5 solid songs from a band that knows (and relishes) their sonic range. Links Facebook. Bandcamp. Last.fm. Soundcloud. Myspace. Posted in Apocalyptic stuff, Post Rock, reviewsTagged Monsters Build Mean Robots, Post Rock, We should have destroyed our generals not their enemiesBookmark the permalink.